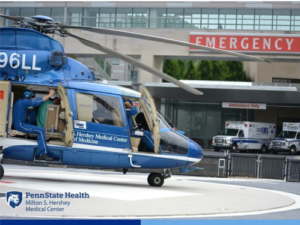 The Emergency Department at Penn State Health Milton S. Hershey Medical Center is seeking exceptional Emergency Medicine EMS-trained physicians to lead a dynamic team of professionals in the roles of an EMS Fellowship Director and an EMS Medical Director in Hershey, PA.
We welcome you to a community that emulates the values Milton Hershey instilled in a town that holds his name. Located in a safe family-friendly setting, Hershey, PA, our local neighborhoods boast a reasonable cost of living whether you prefer a more suburban setting or thriving city rich in theater, arts, and culture. Known as the home of the Hershey chocolate bar, Hershey’s community is rich in history and offers an abundant range of outdoor activities, arts, and diverse experiences. We’re conveniently located within a short distance to major cities such as Philadelphia, Pittsburgh, NYC, Baltimore, and Washington DC. The Penn State Milton S. Hershey Medical Center is committed to affirmative action, equal opportunity and the diversity of its workforce. Equal Opportunity Employer – Minorities/Women/Protected Veterans/Disabled.